Welcome to TracfoneReviewer - with News, Reviews and more about Tracfone Wireless. 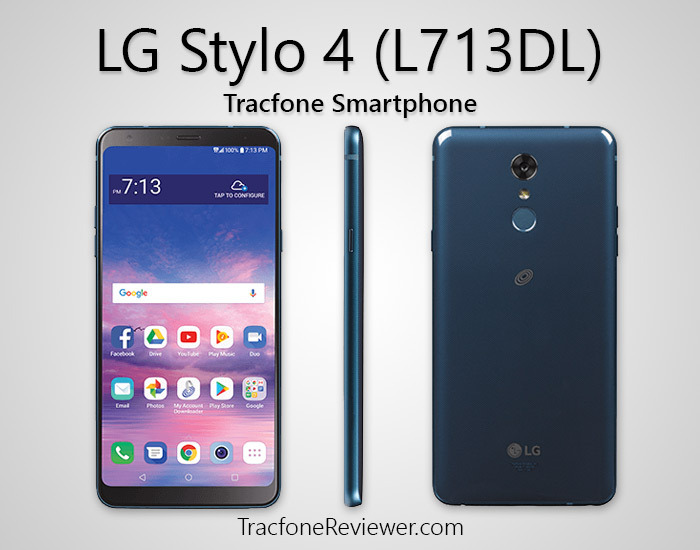 It has been several months since Tracfone released a new device but they have surprised us with something unique in the form of the LG Stylo 4 (L713VL). It follows in the line of previous LG Stylo devices, including the Stylo 3 which we reviewed earlier this year, and the Stylo 2 from a couple years back. The main differences with the Stylo 4 is the amazing screen it comes with. There are not many smartphones with a screen larger than 6" but Tracfone has just released the LG Stylo 4 which features a massive 6.2" screen. If you prefer larger screens, this might be a great option for you. The phone also comes with 16 GB internal storage, 2 GB RAM, an octa-core processor and 13MP rear camera. The huge screen with great resolution plus Android Oreo are two key factors that make the Stylo 4 very interesting. But like many Tracfone devices, it is limited in that it only has 16 GB storage and 2 GB RAM. Another key bit of information to note is that this phone is for use with CDMA networks on Tracfone (primarily Verizon cell towers) and we don't see any information about a GSM version coming anytime soon. Tracfone has released very few GSM smartphones in the last year as they appear to be catering towards CDMA users or markets. As for Triple Minutes for Life, the Stylo 4 does not come with it as far as we can tell. Tracfone's plan is to not include it with any phones released past April 2017 and they appear to be sticking with this policy. For more on this, visit our Guide to Tracfone Ends Triple Minutes. Now here are the full list of features and specs for the Stylo 4. The manufacturer of the Stylo 4 is one of the largest electronics manufactures in the world. LG has a variety of different phones ranging from budget to flagship and a number of them are compatible with the Tracfone BYOP program. There is actually an unlocked version of the Stylo 4 on Amazon with slightly different features. It comes with 32 GB internal storage, 3 GB RAM and is compatible with both GSM and CDMA networks. Beyond these differences it appears to be the same and is currently listed for $50 more than the Tracfone version. Let's get intot the details of what the LG Stylo 4 has to offer with our full review. The biggest feature (pun intended) on the Stylo 4 is the screen at 6.2" with a resolution of 2160x1080. It is larger than the previous model (the Stylo 3 had just a 5.7" screen) and has the best resolution of any phone from Tracfone in this price range. It also features the popular 18:9 screen ratio. The screen is so large that the phone includes a stylus, which is helpful for some users. In many cases we see large screens sacrificing on PPI - Pixels Per Inch, where a higher PPI is generally better. The Stylo 4 has about 390 PPI making it better than most other Tracfone devices in this category. A large screen does make it easier to watch media, or type on the keyboard, however it also makes it more challenging to handle or fit in a pocket. Smartphones with large screens aren't for everyone, but if you do prefer it, the Stylo 4 comes with a very good screen for the price. The Stylo 4 comes with the standard 16 GB storage/2 GB RAM almost every other Tracfone smartphone in this price range has come with in the last year. This phone only has about 8 GB storage space for the user to install apps and save pictures so you will find this very limiting. But if you don't plan to run very many apps, it is less of an issue. The processor on the Stylo 4 is actually quite good, featuring a 1.8 Ghz Octo-core processor from Qualcomm. It is a powerful yet efficient processor that was recently released. The processor on the Stylo 4 won't hold users back, but the RAM and Memory might so keep that in mind. A 13 MP rear shooter is on the Stylo 4 with Phase Detect Auto Focus for better autofocus performance in videos and in darker environments. There are a umber of other features also included such as Portrait mode, Burst shutter, Timer, and Flash. The Front camera is a very standard 5 MP wide view camera capable of selfies and more. The cameras on the Stylo 4 are good and capable of capturing some nice images. This phone easily has one of the better cameras versus other Tracfone devices in this price range. For video, the Stylo 4 has 1080 HD recording at 30 fps which works well for capturing videos to share with friends or family. If you're looking to get better images, see our 8 Tips for Better Cell Phone Pictures. The battery capacity is 3300 mAh which gives users approximately 13hrs of talk time and about 11 days on standby. With the size of the phone we would have expected a larger battery, like the 4000 mAh battery in the Moto G6 Play. With the help of the new efficient processor, the battery life is pretty good overall. The Stylo 4 is the first Tracfone smartphone to feature the newer Android 8.1 Oreo operating system. With each new Android iteration there comes a variety of cosmetic and functional changes, usually for the better, that help with the efficiency and usability of the phone. Because Tracfone smartphones are not able to receive Android updates like unlocked devices, it is important when purchasing a new phone to make sure you get one with a newer OS so you don't have to worry about security issues in much older versions. With any phone in the budget price range it will have to sacrifice in some areas to keep the price low and with the Stylo 4 we see that especially in the storage and RAM for the phone. However, the screen and processor are both quite good, leading to a great overall experience as long as you don't need a lot of storage and won't be playing resource intensive games or applications. The fact that it also features Android Oreo is also a huge plus, and the camera on the Stylo 4 is also good for a phone at this price. The main consideration for most users will be if they want a phone with a 6.2" screen which will be great for watching videos but may be hard to hold or fit in a pocket. For a phone with a smaller screen but otherwise similar features, consider the LG Premier Pro. Let's look at what may be the closest competitor, the Moto G6 Play. The Moto G6 Play is an unlocked smartphone available at the same price, about $199, and has a variety of pro's and con's compared to the LG Stylo 4. The Moto G6 Play has more RAM, at 3 GB and also more internal storage, 32 GB, compared to the Stylo 4. The G6 is unlocked and compatible with either GSM or CDMA networks and can be used with Tracfone BYOP. As for battery life the Moto G6 Play is a beast in this category with many users getting two days of use off of a single charge. Both the Stylo 4 and G6 Play have similar 13 MP cameras and they both run Android Oreo. When it comes to screen size, the Moto G6 Play has a smaller, 5.7" screen with less resolution and DPI. The G6 Play only has a quad-core processor compared to the superior octo-core processor in the Stylo 4. Each of these phones have some great features, and some areas where costs were cut. Right now you can get the Moto G6 Play on Amazon for just $191. The LG Stylo 4 is available from several different retailers and we expect to see it offered from more in the near future. We have also found it on Amazon for $229 . That concludes our review of the LG Stylo 4 from Tracfone. We hope you found this review helpful. Leave a comment with your thoughts or questions! Don't miss out on our Guide to Making Your Airtime Last Longer which has a number airtime saving tips. We also recently updated How Data Works on Tracfone Smartphones which also includes information on how to buy just data for your phone. Join us on Facebook to keep up with the latest news and reviews. And finally, see our Deals, Discounts and Sales for all the best prices on Tracfone devices and unlocked phones. 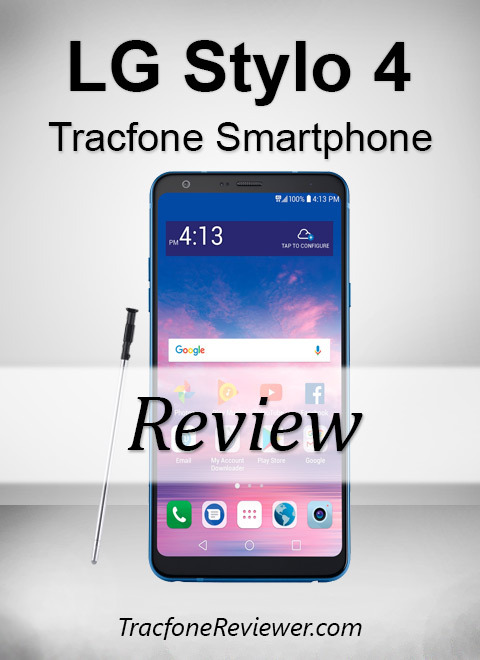 Welcome to the TracfoneReviewer blog! 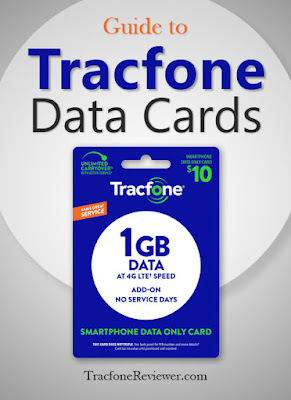 This post will share specifics on how data works on smartphones with Tracfone. Be sure to also take a look at some of our other posts while you're here. 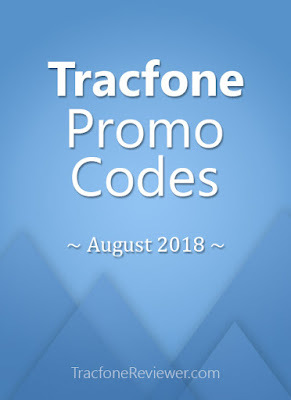 Note - We created a full breakdown and comparison of Tracfone airtime in this post: New Prices/Changes to Tracfone Smartphone Cards. Tracfone is a prepaid cell phone service provider that offers both phones and airtime cards. On their newer smartphone devices, you also get data when adding an airtime card which you can use to surf the web when not connected to WiFi. Some of the popular smartphones that Tracfone offers include the LG Rebel 4, Moto G6 and Samsung Galaxy J7 Crown. You can see all the newest devices in our List of the Latest Smartphones from Tracfone. Or you might be interested in the Tracfone BYOP program, which allows users to bring their own smartphone. Follow the link to learn more, and see a list of the possibilities. On Tracfone Smartphones and BYOP devices, airtime is split into three pools, Talk, Text and Data. Learn more about How Airtime Works with Tracfone Smartphones in our recent post. How Can you Buy More Data for your Tracfone Device? Airtime Cards - You can add both Regular Airtime Cards or Smartphone Only Cards and get a certain amount of data along with talk, text and service days. As mentioned above, the Data only card increase the amount of data for your smartphone, without adding any additional texts or talk minutes. This is similar to the Text only cards we recently discussed. There are some important things to be aware of the make the Data only cards unique. Second, like the Text only card, Data only cards do not triple, so you get the amount listed on the card (1 GB). This results in 1 cent per MB of data. Below is a table with all of the current airtime cards from Tracfone and how much data comes with each one. We've included both Smartphone only cards and regular airtime cards. In general, if you only need data, the data only card is a good deal. But if you also need talk and texts, then the 300 or 750 minute smartphone cards are a good deal. Remember, that if you want to stop using data, you can go into the settings on your device, select data, and turn it off. Using WiFi networks, like at your home or work, does not deduct from your data. Here are some helpful tips to reduce the amount of data you use. If you use Google Maps often in a certain area, download the map of that area over WiFi. Here is some helpful information about using Google Maps without using data. Download songs/podcasts over WiFi instead of streaming them. Set your Apps to only update over WiFi. As you can see, the best way to reduce data usage is to avoid using it for large downloads or uploads, which will quickly drain your data. Using free WiFi whenever possible will go a long way in extending your data. Learn the basics of how Tracfone works with our Beginners Guide to Tracfone. Find us on Facebook and join over 2000 followers who get the latest news and updates. Take a look at one of our other popular posts, the Over 30 Great Android Apps to use with your Smartphone. And check our recent post on 7 Ways to Reduce Your Airtime Usage with Tracfone including some more tips for making your data last longer. The end of summer is near and we have collected new codes to share for August 2018. There are promo codes for both regular airtime cards and smartphone only cards. Each code is for use with a specific airtime card, but some codes, particularly for the regular airtime cards, may be used with airtime cards of greater value as well. To use a code simply find a code for the airtime card you want to add, and then include the code at checkout in the 'promo code' box. Remember that some codes may be one time use. If you find your airtime running out quickly, maybe check out our recent post on 7 Ways to Make Your Prepaid Minutes Last Longer which also includes some tips specifically for making data on smartphones last longer. Don't miss out on what's new from Tracfone with our Latest List of Tracfone Cell Phones and we also recently updated our List of the Best Tracfone Smartphones (2018) to add a new phone or two. These are the latest codes for August, for even more promo codes visit our main Tracfone Promo Code page. No new smartphone codes at this time, we will update as soon as we can! These are the latest codes, we hope you were able to find one that worked for you. Leave a comment below with your thoughts or questions. Join us on Facebook for all the latest news, posts and community help. You can also send us a message with specific questions. Take better cell phone pictures with our 8 Simple Tips for Better Smartphone Photos! Lastly, get all the best deals in our monthly Deals, Discounts and Sales on Tracfone devices and more.